Creative Commons / Angkor Wat / IMG_2932" by Neil Rickards is licensed under CC BY 2.0. This article was originally published on 06/18/14 but has since been updated with new and more relevant content. Planning a silent auction requires careful and strategic thought. Everything from determining starting bids to setting bid increments should be given due thought. How should you set up these bidding rules? Throughout this article, we will provide you with best practices to ensure your starting bids and bid increments won’t get in the way of generating more revenue. A quick google search will lead you to some rules of thumb and some best practices. The most common basis for setting these bidding rules is “Fair Market Value” (FMV). Many websites will tell you to set your starting bid as a percentage (e.g. 30-40%) of FMV. Be aware, if your fair-market-value is inflated, your item’s entry point may be too steep for bidders. Keep in mind that FMV can often be subjective (meaning the donor may over-value the items they are donating to your auction). So be cautious when basing your starting bids using it. It's critical, to be honest, yet fair with FMV. After all, it starts with the word “fair”. If your item is a $100 gift certificate, then its value is clearly $100. We understand that not all items are so obvious, but try your best to assess the value of any and all items “fairly”. Don’t just take a donor’s word on the value of an item. They may have their own purposes for inflating the value. Do your research. First, check the internet for similar items. Second, see if you can gather an expert opinion or two. The more accurately you can assess the FMV of your items, the more value you can provide to your silent auction attendees. 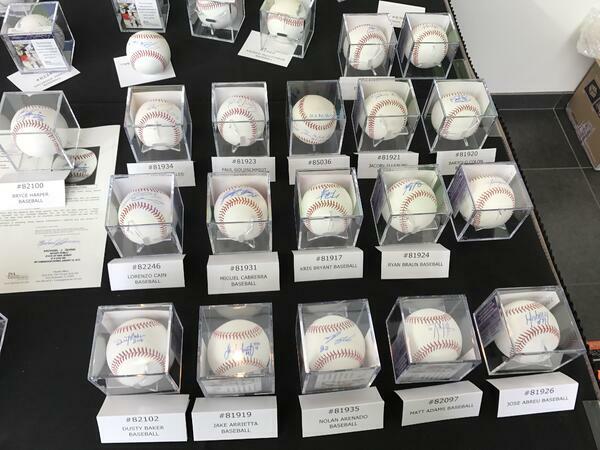 Insider Example: A donor once told us that a signed baseball was valued at $250. After a quick google search, we found the same ball for $75 at multiple locations. An accurate FMV will help you generate interest in the item and hopefully “create an auction” for it. If your FMV is too high, you may not attract enough bidders to bid on it. If your FMV is too low, you may set the starting price too low and leave money on the table. So do your best to determine what you think your bidders would be willing to pay for the item in a typical setting (when emotions, charities, and alcohol are not involved). Earlier we mentioned, some advisers will tell you to set minimum bids at around 30-40% of fair market value. Our expert opinion is that setting starting bid prices tends to be more of an art than a science; and, formulas don’t always work. So, while a starting bid of 30-40% of fair market value is okay, auctions work better with higher levels of engagement. In order to increase engagement, attract more bidders with a low (but fair) starting price. When we see fewer than expected bids on an item, the most common mistake is that the starting price was too high. As we mentioned, a high starting price excludes more potential bidders, some of whom would help to drive the bid price up higher had they been willing to place that first bid. As we know, once you have bidders engaged, you create the opportunity for competition to take over, emotions to get the best of people, people to bid well beyond their initial limits, and for revenue to go up! Outside of starting bid prices, we also see items with absurdly high bid increments. In fact, after years of data crunching, we have surmised that the bid increment is more influential on overall auction performance than the item’s starting price. So our advice is: keep bid increments AS LOW AS POSSIBLE. 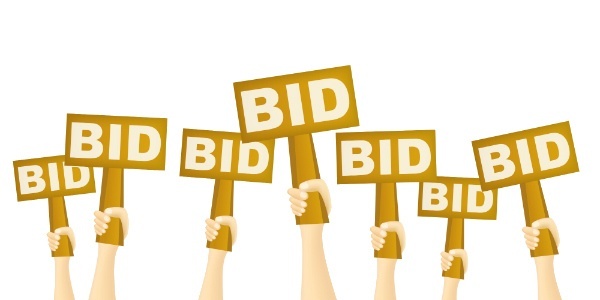 The common practice for traditional silent auctions with paper bid sheets was to set moderately high bid increments in order to create an incentive to check bid sheets. Because let’s be honest, few people are willing to leave their table or conversation to increase their bid by a few dollars. But with mobile bidding, the cost for a bidder to place a higher bid is much less (they can do it with a few swipes and taps) and don’t have to walk anywhere. So why is this important? Because higher bid increments will dissuade more people from placing a higher bid. Let us look at an example. Picture an item with an FMV of $1,000. If we use a ratio of the minimum bid at 40% of FMV and increment at 20% of the minimum bid, we would have a starting bid of $400 and a bid increment of $80. This automatically prices out anyone who would have paid $400 - $480 or $480 - $560. Your goal should be to start a bidding war. Once this happens individual’s’ emotions take the driver seat and their logic hops in the back seat. Suppose you want to get approximately 13 bids for an item that has a starting bid of $400 and an “accurate" fair-market value of $1,000. Our recommendation would be to set the bid increment to $40 -- or, 10% of the FMV. Bringing in $920 for a $1,000 item is 92% of the FMV, and is considered a triumph by any auctions standards. Drive engagement by lowering your bid increments. How low? As low as you can stomach. If you have an item that is worth $2,000, don’t simply set a bid increment of $200. Try something more reasonable like $50! If you create enough traction on the item, it may well go for more than the FMV. One important point, however, is that you need to give people enough time to bid. Bidders need some time to warm up. If you are having an event, that warm-up time often includes a trip to the bar, catching up with friends, and browsing the auction. If you only give your bidders 60-90 minutes to bid, that may not be enough time allow the bidding wars to materialize. Mobile bidding allows you to open the auction earlier and keep it open longer, so take advantage of that! So allow the bidding wars to commence! With a paper bid-sheet auction, shorter bid times and high bid increments may have been the norm. But mobile bidding makes it easy to get connected to an auction and stay connected (from anywhere). So don’t let tradition get in the way. Start the items lower than you think, make the bid increments lower than you think, give people enough time to bid. If you do those things, we are confident you will increase your chances of driving higher revenue on desirable items. When you have a great set of items and eager bidders, setting starting bids and bid increments play a major role in the success of an auction. Instead of rolling the dice, check out how Handbid’s mobile bidding software can help your silent auction succeed.